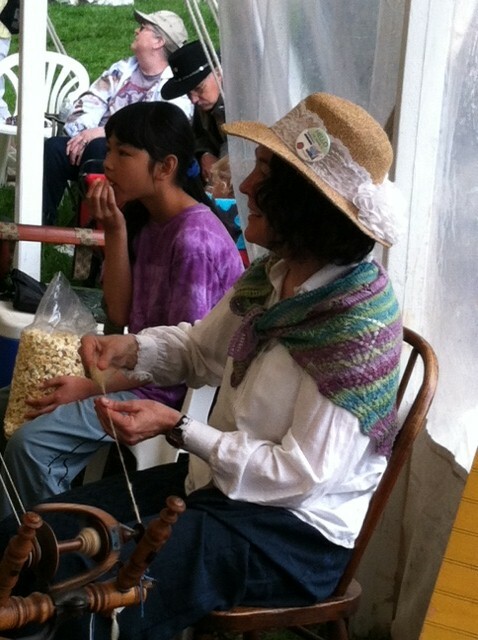 Yesterday four of us from my local spinning group did one of those insane things called a Sheep to Shawl competition, at Maryland Sheep and Wool. Here is how it works. You leave your house at 0-dark:30 to be able to drive into the fairgrounds and unload much equipment (including a warped loom) into a tent and get your car back out again, and be at the figurative starting line at 8am. At 8am, the shearer you’ve recruited comes and grabs the sheep you’ve recruited and drags her off to be sheared. You follow. When the judge has examined the newly shorn sheep and the pile of greasy fleece and given approval, you grab that fleece and shove it in a basket and run for your battle stations. After that, it’s nose to the figurative greasy grindstone for a couple of hours. We chose to flick the locks and spin them that way. 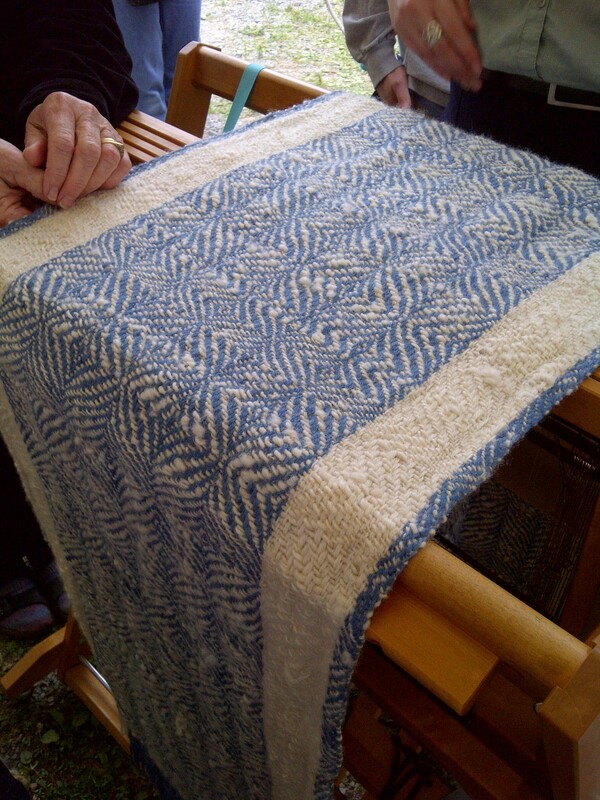 The team beside us (who were the winners and obviously were total pros at this) all sat down on their mat and began carding like madwomen, until they had enough rolags to produce the entire quantity of weft they needed. We brought antique Canadian production wheels, and made a gesture toward costuming with blue skirts, white shirts, shawls, and straw hats. You can see a few pictures of us at work here, and I hope there will be more to be found. Here’s one someone just sent me! Thanks! I did get a picture of our finished product before we turned it in. We placed fifth out of seven which is not bad for novices I think. We got lots of ideas for what to do differently, by watching the teams who did better. If you give us a week to recover, you might hear us say we want to do it again!